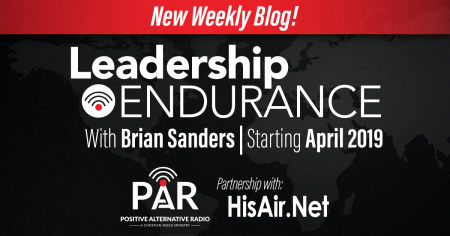 “Leadership Endurance,” is the title of a new weekly blog written by Brian Sanders, Executive Vice President of Positive Alternative Radio and coming to the Christian radio industry site HisAir.Net beginning the first week of April. Sanders writes, speaks, and coaches on leadership through his work at PAR. The blog will address leadership issues relevant to anyone in Christian radio. His new book, also titled, “Leadership Endurance,” is pending publication early this summer. Sanders said he is very pleased that a partnership with HisAir.Net has made the weekly blog possible. The site has many avid readers, he noted, adding that he is thankful to have a weekly forum to reach Christian radio station general managers, program directors, and others. If you have a web design manager, you can quickly create your own website. Know something about an interest and like to talk?